I think I saw a Blue Helicopter version of Obsidian as part of the same segment or episode?? I'd have to think that was right. he's RID ? is he? because I thought Sky-Bite had a steady role there. 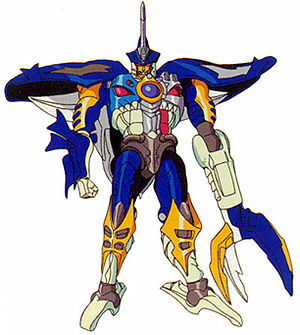 But all I remember really is that the idea of the Shark Transformer -independent treasure hunter guy fascinated me. I'm not sure about that though. Well, Sky-Byte wasn't a treasure hunter, and did have a prominent role in that series. I can't recall any TF cartoon character who was both a treasure hunter and turned into a shark. Sabrblade wrote: Well, Sky-Byte wasn't a treasure hunter, and did have a prominent role in that series. Well, my dear Sabrblade, If you recall in several episodes he kind of acted as a treasure hunter, searching for things in caverns, underwater pyramids, and pyramids inside caverns. Is this the Episode, Starry? I found it on youtube and I think that must be it. like the picture where he pushes Opt into the water. That must have been very near the time I came in on the episode. starry* *night wrote: I found it on youtube and I think that must be it. I had attached the video in my post, but it didn't show up for some reason... strange.